Tip: Before we get started, we recommend understanding what skill assessments are and how to get your Skill IQ. This will help you as you learn about Role IQ. 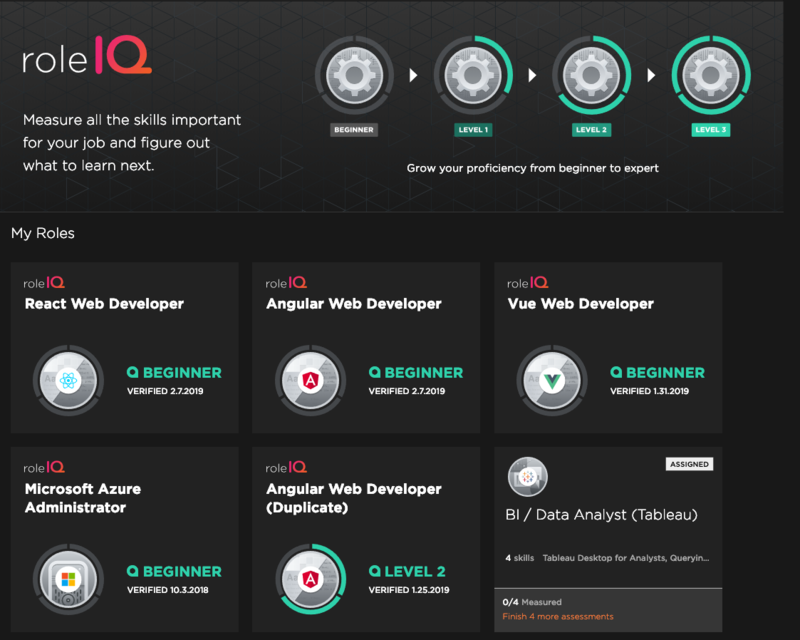 Available to all learners, Role IQ helps you understand the skills important to your role. There is no limit to the number of Role IQs you can get. Feel free to check all of our roles here. Roles are built by our author network, industry leaders, and partners using a foundation of skill assessments in various technologies. If you're on an enterprise plan, this also includes custom roles built by your organization. How do I get my Role IQ? All roles can be found on your Role IQ page. For learners on an Enterprise or Professional plan, assigned roles from your plan admin or team manager will show here. You will receive an email notification if assigned a role. Role IQ cannot be shared on social media at this time. Visit your Role IQ page and click a role that interests you. Click the current level you feel you are. Choosing a current level provides you with a reference point in skill level for you to look back. If you're on a business plan, self-assessing allows for you to be on team analytics. Find the Unmeasured Skills area and begin assessing. Each skill assessment has around 20 timed questions and will take up to 5 minutes to complete. After you take each required skill assessment, you'll receive your Role IQ level and summary. Important: You may come across a skill assessment in a role marked BETA. This means we are still validating the skill assessment. Your Role IQ will be pending. Once a skill assessment is moved out of beta, you must take the assessment again in order to finish your Role IQ. The My Roles area of your Role IQ page includes started and completed roles. If a role was assigned to you by your organization, an assigned designator will show in the top-right of a role. Click the option button in the top-right of a role to delete a role. Don't worry - we still keep your progress but the role will be remove from your My Roles area. You cannot remove a completed or assigned role.